If you鈥檝e ever seen shawarma cooking on a spit or rotisserie, you know how amazing spiced meat smells as it roasts. Surprisingly, making shawarma at home doesn鈥檛 require any special equipment. In fact, all you need is a sheet pan to make a big batch of fragrant, juicy chicken that you can stuff into pita, roll up into lavash, or serve atop a grain bowl. Set out bowls of veggies and some sauce for drizzling, and everyone can assemble their own delicious dinner just the way they want it. The beauty of this recipe is that while the chicken can be marinated up to one day ahead, if you don鈥檛 have the time or didn鈥檛 plan in advance, just 20 minutes while the oven is heating up will do just fine. The marinade allows the cumin and warm spices like cinnamon and allspice to work their magic on the chicken. The chicken roasts in a really hot oven, so thin cuts like boneless, skinless chicken thighs or chicken tenders work best. This also means there鈥檚 lots of surface area for the spices to cover, making the meat extra-flavorful. If the weather鈥檚 nice, you can also grill the chicken outside on medium-high heat for five to six minutes on each side. While the chicken鈥檚 roasting, prep your veggies. I like diced tomatoes, diced cucumbers, and shredded romaine lettuce for crunch, but you can always up the ante with some pickled onions or crumbled feta cheese. And don鈥檛 forget some tasty sauce for drizzling over everything 鈥� you can鈥檛 go wrong with hummus, tzatziki, green tahini, or yogurt-dill. 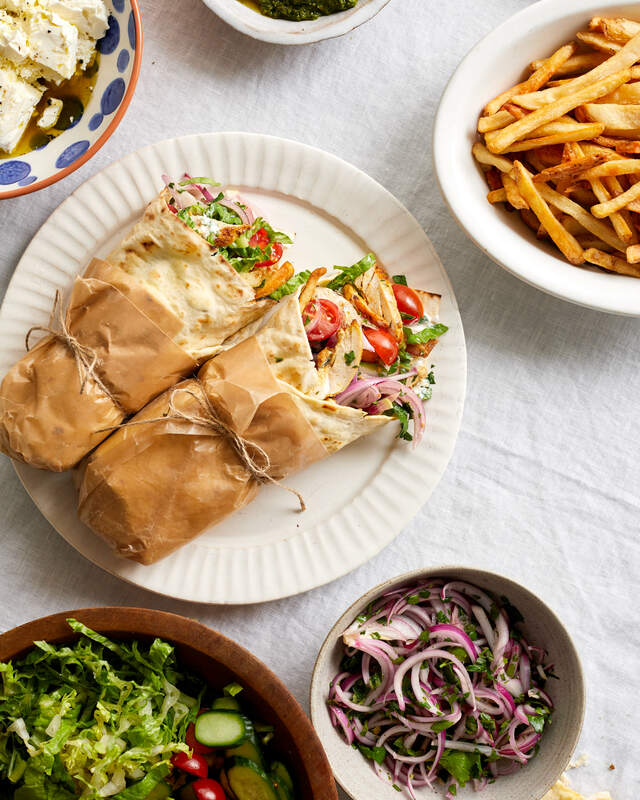 Wrap everything up in soft pita or lavash, or serve over your favorite cooked grain. Stir the oil, garlic, salt, pepper, cumin, allspice, cinnamon, and turmeric together in a large bowl to form a paste. Add the chicken and toss to coat; let marinate at room temperature while the oven heats, at least 20 minutes, or cover and marinate in the refrigerator overnight. Arrange a rack in the middle of the oven and heat to 425掳F. Line a rimmed baking sheet with parchment paper or oiled aluminum foil. Place the chicken on the baking sheet in single layer. Roast until browned and cooked through, about 30 minutes. Let cool 5 minutes. (If using pita or flatbreads, stack them, wrap in aluminum foil, and place in the turned-off oven to warm through.) Thinly slice the chicken crosswise. 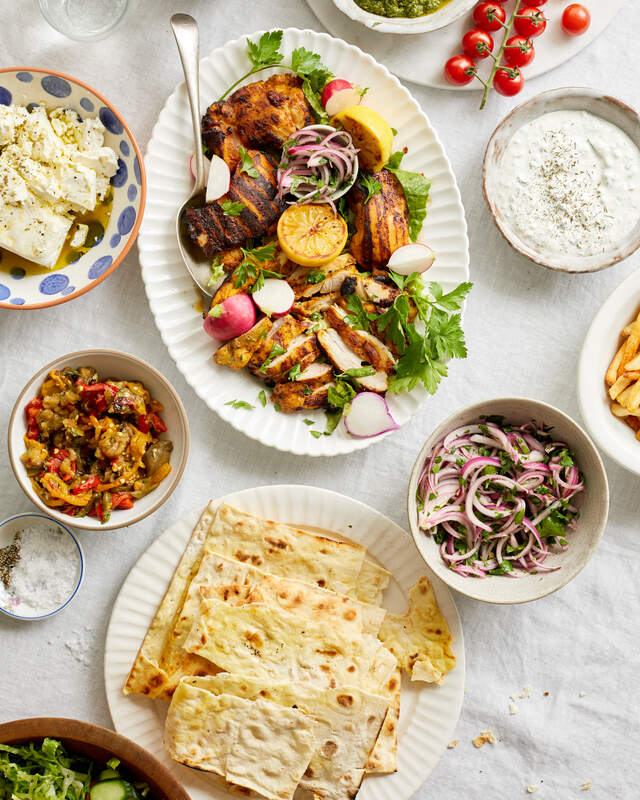 To serve, divide the chicken among the pita, lavash, or flatbreads. Top with the lettuce, tomatoes, and cucumber, and drizzle with sauce. For pitas, fold up the sides like a taco. For lavash or flatbreads, position with the long side facing you. Fold the bottom up and over the filling, then fold one side in towards the center over the filling. Continue rolling up tightly like a burrito. Make ahead: The chicken can be marinated and refrigerated up to 1 day ahead. Storage: Leftover chicken can be refrigerated in an airtight container up to 4 days. Grilling option: The chicken can be grilled instead. Grill covered on an outdoor grill set to medium-high heat for 5 to 6 minutes per side.